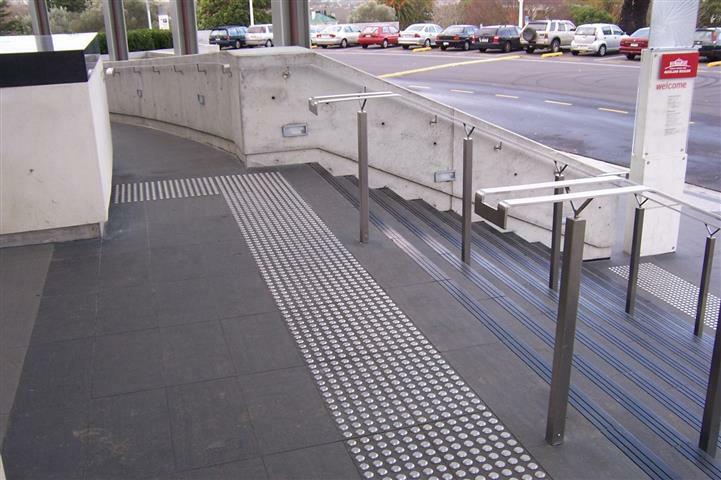 TWSIs for stairs should meet the general guidelines described in the section Tactile Walking Surface Indicators. An attention TWSI is located at the top, starting one tread length back from the leading edge of the nosing at the top of the stairs. Be placed on landings at the top of stairs and on landings where there is an entry to the stair system. Be placed at the top of each flight of stairs at landings longer than 2,100 mm that do not incorporate continuous handrails on both sides. Be placed at locations where the regular stairway pattern is interrupted. Commence one tread depth back from the front edge of the nosing of the top step, extending the full width of the stairs for a depth of 600 – 650 mm. Consist of truncated domes or cones that contrast in colour and brightness.